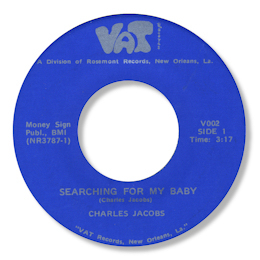 Charles Jacobs was born in Prentiss, MS but moved to New Orleans as a young adult. This disc from the early 70s would appear to have been his only recording from the classic period – but what a good one it is. Backed by a righteous female singer on You Made Me That Way Charles comes across big and strong with a tasty gruff tone. The small band behind them, with Charles playing the guitar I presume, do a good gospel based job. The label is affiliated to the Rosemont company that put out a couple of fine 45s on Alex Spearman. By the 90 Charles was earning a living playing on the tourist trap that was Bourbon Street – but I don’t what happened to him after Katrina. You can read more about him here. Thanks to Bob McGrath (see Links) for the suggestion.